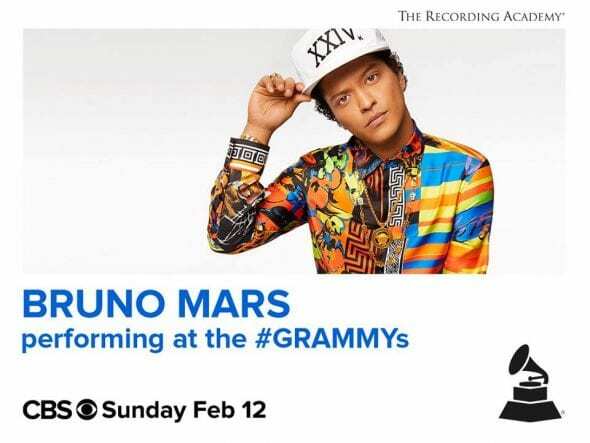 SANTA MONICA, Calif. (Jan. 25, 2017) — The Recording Academy® announces Bruno Mars will join this year’s lineup for the 59th Annual GRAMMY Awards® telecast. The four-time GRAMMY® winner and current nominee will return to the stage to perform for the first time since 2013. Mars joins previously announced performers Adele, John Legend, Metallica, Carrie Underwood, and Keith Urban. Taking place at STAPLES Center in Los Angeles and hosted by award-winning television personality and performer James Corden, the 59th Annual GRAMMY Awards will be broadcast live in HDTV and 5.1 surround sound on the CBS Television Network, Sunday, Feb. 12, 2017, at 8 p.m. ET/5 p.m. PT. Mars is currently nominated for Album Of The Year for his work on Adele’s 25. He has performed at The GRAMMYs® four times previously, including twice at the 55th Annual GRAMMY Awards in 2013. Established in 1957, The Recording Academy is an organization of musicians, songwriters, producers, engineers and recording professionals dedicated to improving the cultural condition and quality of life for music and its makers. Internationally known for the GRAMMY Awards — the preeminent peer-recognized award for musical excellence and the most credible brand in music — The Recording Academy is responsible for groundbreaking professional development, cultural enrichment, advocacy, education and human services programs. The Academy continues to focus on its mission of recognizing musical excellence, advocating for the well-being of music makers and ensuring music remains an indelible part of our culture. For more information about The Recording Academy, please visit www.grammy.com. For breaking news and exclusive content, follow @RecordingAcad on Twitter, “like” Recording Academy/GRAMMYs on Facebook, and join The Recording Academy’s social communities on Google+, Instagram, Tumblr, and YouTube.